"Mercurey oak has long been an important partner to my winemaking. The oak quality, and nuanced toast selections, make it one of the most versatile coopers available. The larger formats work particularly well with both old vine Hunter Shiraz and cool climate Pinot Noir. Some of the best wines I've made have included Mercurey in the mix." Jim Chatto winemaker Chatto & Mount Pleasant. Tonnellerie de Mercurey is well-known for its precision in blending oak precision; by bringing in each single barrel 3 specific forests. During the last 20 years, the oak blending methodology and philosophy brought a great amount of satisfaction in the market, especially due to its consistency and homogeneity year after year. The grain represents the annual growth of the oak tree in one year. Depending on rainfall, soil richness and competition with adjacent trees, the speed of the growth may vary to produce grains of different sizes (from less than 1 mm to up to 5mm). A fast or a slow growth will result in a different proportion of the different tissues of the wood, hence; a different chemical composition of the wood. After seasoning, the staves are made. The staves are re-sorted and separated in 4 new traceable groups. Grain 3-4 mm, which will be added to all our 2 or 3Y oak blends. 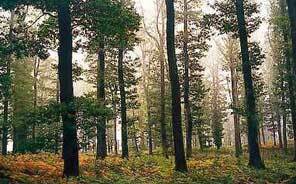 We can distinguish 2 kinds of Forestry management techniques. Those forests can remind you of French gardens. They were designed to grow high quality wood for boat construction. What the industry of wooden warship could never use due to the invention of steam power, makes some of our finest barrel wood. Trees are planted in high density, up to 100 000 trees per hectare, and selected year after year in order to produce after almost 2 centuries, 150 high quality mature trees. The secret of this method is the competition between the trees that pushes them to grow in height to seek light. Wood sourced from Futaie generally presents a homogeneous tight grain. Furthermore, in several areas, the French forestry management has increased the level of competition in between each oak in order to push up the first branches. This is done by increasing the time between harvesting The consequence is a higher oak with finer grain. Linked to the size of the trunk, this specific forestry management appellation in “Haute Futaie”. These forests represent to date 70% of the French forest. Contrary to the former type, they are naturally renewed and present a wilder appearance. Every twenty five years or so, mature trees are harvested and small unpromising trees are destined to fire wood. Wood sourced from Taillis sous Futaie can present heterogeneous grain and a smaller percentage of the wood harvested can be used for cooperage. In recent years, some Taillis sous Futaie forest have been slowly transformed into Futaie by forest keepers and owners concerned about wood quality. We call those forest " Taillis sous Futaie en Conversion". While we know the importance of terroir for the grape, oak trees grow in the same spot for 150 to 200 years, unaffected by vintage quality; they take on the soil composition of their exact growing place. This has also a big impact on the oak color. Oak forests generally grow on poorer soild as the richer more fertile soils have long be reserved for cereal and food production. These poor soils strongly affect wood quality and chemical composition depending on mineral and water resources and their physical characteristics. Influenced by terroir, climate, exposure, adjacent trees, every tree is unique. To compose a homogenous and consistent blend year after year we use these three criteria grain size, forest management and terroir to evaluate objectively the quality of each stave.